A native Texan, Trey has been a student of the game since the age of 5. He has played and coached at multiple levels of the game for over 20 years. In his youth, he played for the Dallas Texans Select Club, and in Minnesota he played for CC United. Trey lettered and started as goalkeeper for his high school team in Arlington, Texas his Junior and Senior seasons. He played for Texas Tech University Men’s soccer club then transferred to West Texas A&M, before enlisting in the USMC. Trey served our country until 2012, serving 3 tours of duty overseas and was awarded Navy and Marine Corps achievement medals with Combat Valor as well as a Purple Heart for being wounded in Combat. While in the Marines, Trey played soccer for his units soccer team as well as his military base soccer team. 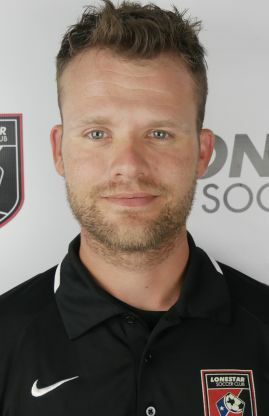 Trey coached the youth select base housing soccer teams for 3 years while stationed at Camp Lejeune. After being wounded in action and completing several years of rehab, Trey decided to bring his love for the game and coaching skills back to Texas. Trey believes in helping and giving back to the youth on and off the field, teaching self-confidence, passion for the game and perseverance through adversity, soccer development, integrity and loyalty as well as all around character building. Lonestar SC is 501(c)(3) non-profit organization.